A classic locally owned steakhouse in downtown Santa Barbara. 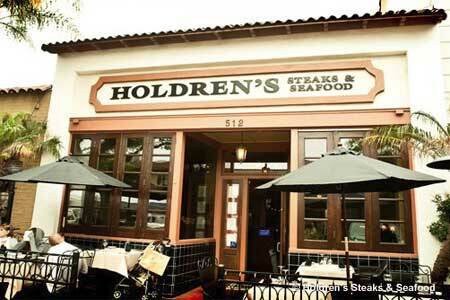 : Specializing in mesquite-grilled Prime beef and top-shelf martinis (the beautiful wood bar is the oldest in Santa Barbara, built in 1928), Holdren’s is a great place to host an old-fashioned martini lunch on the outdoor patio right on State Street’s busy 500 block. Appetizers include crab cakes served over rice pilaf with a lemon-Dijon crab sauce, and the steak and grilled romaine salad topped with small chunks of filet mignon, tomato, red onion and crumbled blue cheese, then drizzled with a blue cheese vinaigrette. Steak lovers should try the signature cowboy cut, a 24-ounce, bone-in rib chop, or the jalapeño pepper jack pork chop. Daily specials include offerings like all-you-can-eat baby-back ribs and a Prime sirloin with Alaskan king crab combo. Fresh seafood selections are surprisingly good, like the grilled mahi mahi finished with a citrus and lobster cream sauce. You may also find tiger prawns wrapped in apple wood-smoked bacon or seared Hawaiian ahi with a spicy mustard soy sauce. Also located at 1714 Newbury Rd., Thousand Oaks, 805-498-1314.